Inverness sleeper cabin, originally uploaded by Rory Brown. This time I was travelling up with a friend and we were joining our families at Greenhill for a long weekend. We booked late so missed out on some special deals and travelled second class. The single tickets cost £141 each (ouch) but because the train left at 9.15pm it meant that I didn’t have to take any additional time off work so felt it was worth it. Paul and I both arrived at London Euston about 40 minutes before the train was due to leave. We left our bags in our cabin and headed straight for the lounge car. I’d strongly recommend arriving early. The lounge car is small and if you don’t get a seat you miss out on the main reason for travelling by train. We settled down and ordered the first of several rounds of drinks from our friendly host. This was followed by a reasonable selection of food from the menu. All the hot food was microwaved but not too bad – Paul went for the haggis, neaps and tatties to start his acclimatisation. I was less brave and stuck to a selection of cheese, biscuits and strong lager..
Around midnight the lounge car had all but emptied and we decided it was time to turn in. Heading back towards the cabin a little the worse for wear I clambered onto the top bunk and dozed off. In the morning we were gently awoken by the our carriage host. He brought in a box of breakfast and some coffee and told we were an hour away from Inverness. It was only in the light of day that the cabin started to feel a bit like a prison cell. There is a small washbasin but really no room for 2 people to stand up at the same time. The view out of the windows across the Cairngorms made up for it though. As we pulled in to Inverness and got off the train I felt some of the sensation of getting off a boat. The constant rocking during the night meant it took me a little while to stop swaying from side to side. By 9.30 we had our hire car from the Thistle Hotel – a short cab ride from the station – and were on our way to Achiltibuie. Would I recommend the sleeper train as a way to travel to the Highlands? Absolutely. But I do think it could be vastly improved. The idea of being able to travel in a pub to your destination is a very attractive one and it’s so nice to avoid airport security and delays. However, it did feel as though Scotrail are missing a trick with the Caledonian Express. They are clearly trying to compete with EasyJet and Flybe for customers and have therefore not made much of an investment in the service. Entering the lounge car felt like stepping back in time 20 years and surely there are opportunities to carve out a luxury segment of the train travel market? We checked out the First class cabins as we got off the train and there seemed to be no difference apart from being single berths. They were able to order room service but it was still the same microwaved fodder. Imagine if they were to offer a pullman style dining car and proper beds? Now that would be differentiation worth paying for.. I can only agree with you that ScotRail are missing an opportunity. Especially in Summer going south. A few years ago I spent the evening in a lounge car seeing Rannoch Moor on the West Highland line. It was awesome with great views of mountains, moors and red deer. Offering a pub food service and enough space in lounge cars to service most of the passengers would be good. They could offer double beds in extra large cabins or even showers. If they were of a higher standard they should compete for business travel. The price of the sleeper would be an alternative to a flight and night in a hotel. As you noted, first class is the same – the upper berth is simply locked up against the wall. Unfortunately there are a number of problems facing the sleeper. As is stands, the sleeper loses money. It’s a franchise obligation with lots of popular and political support. But it’s terrifyingly expensive to run. One sleeper coach can hold a maximum of 24 passengers. Compare that with more than a hundred in a day time train, and remember the extra costs involved with staff on board, cleaning linen etc. Additionally, it is painfully uneconomical to haul the five trains from London to all five sleeper termini (Edinburgh, Glasgow, Aberdeen, Inverness and Fort William). That would require five locomotives, five lounge cars, five sets of crew etc. So the services are grouped into two, one for the cities and one for the northern termini. That saves a fortune, but it means that both trains occupy the full length of Euston’s longest platforms. They simply can’t grow to accommodate proper restaurant cars for all the passengers without lengthening each train by two or three coaches, which would force them to run separate trains. And besides, as every railway in the western world has realised, dining cars never make money – they haemorrhage money through the extra cost of staff, kitchens, keeping food etc. There are very few full service dining cars left anywhere in Europe, and Amtrak in America has been steadily downgrading theirs to reheating plated meals. 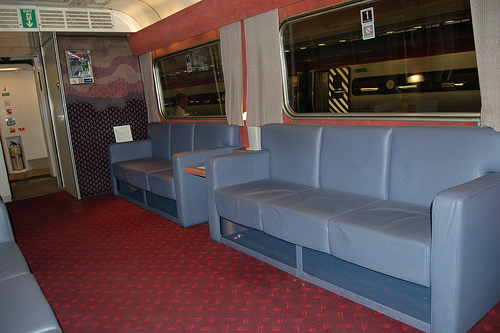 In France, most sleeper trains have been downgraded but rebranded as “Lunéa” trains. These are very simple dorm trains, with only one or two types of second class service, with cabins of six or four berths. There’s no linen (you get a re-usable all-in-one sleeping bag which you don’t undress to sleep in) and no service car – just a couple of vending machines in the space previously occupied by a cabin. These are reasonably successful, but only because the French already had a ready stock of high capacity sleeper cars. Unfortunately the First Scotrail and First Great Western (London to Penzance) sleepers are smaller (to fit our tunnels) and are the only coaching stock we’ve got. There’s precious little spare stock knocking around either. There were dozens of brand new coaches lying around after the Nightstar (Eurostar sleeper) project was scrapped, but we sold them at a knock down price to VIA Rail in Canada. Unless someone wants to invest in new trains (we’re talking millions of quid) then the economical case for improving these trains as you suggest has never made sense for Scotrail. But as long as I get to wake up and clear a hangover with the Scottish Highlands, I’ll keep on using them ! Thanks or your detailed comments. You’ve obviously spent many a lounge-fuelled hour considering the possibilities! I’ll take your word on the economics & logistics but it still seems a real shame that there is no way to turn this into the luxury experience I think it deserves. I should have provided the link to the Bargain Berths section in my original post. Bargain berths are available from £19 (which has to be phenomenal value) on certain routes. 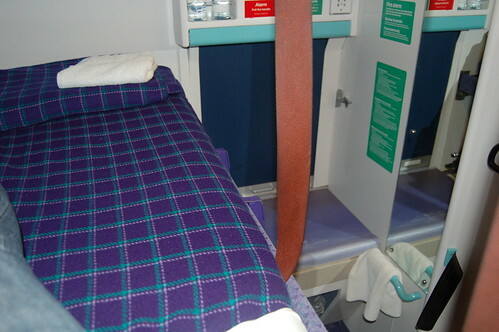 I have just read your comments on the sleeper train london to inverness – oh, August 2008 – because it came up on my google search for more information on the sleeper train service. I find the whole idea of a sleeper train quite qauint and appealing, but not having used one before, am a little wary. I am visiting relatives way up north, around Easter. They advised Inverness for flights or trains. Much that your journey looked v enjoyable, your reference to a moving pub, or somesuch comment, alarms me a little because I will be travelling alone at night with my daughter. Do I have reason to be concerned? Will we find ourselves surrounded by boozy men who do not wish to sleep? (no offence intended) Shall we have little privacy and find that we’re sharing a loo at night with drunken strangers? Just a thought. Your comments, should they be received, may influence my decisions. It does appeal, but a little more luxury wouldn’t go amiss. The prices however, seem very reasonable compared to car or flights. I am not actually expecting a response because you posted that some time ago, but here goes, all the same. Very interesting site by the way. Haven’t paid attention if this is a blog or website. I thought the sleeper train was a really good option for traveling from London to Inverness. It is a bit tatty but theres no reason to hang out in the lounge car if you don’t want – just take a good picnic and book and go straight to your cabin. The best thing from my point of view is traveling overnight saves you a day& you don’t have to go through all the hassle of airport security etc. If you can benefit from the cheap deals it is also incredibly good value. Thanks for the comments about the site and have a good trip whichever way you end up traveling. I found your site while looking for prices for the Caledonion Sleeper. I used it two weeks ago to travel to Aberdeen and wanted to see what prices would be like in August. I was travelling with children aged 1, 5 and 14 so the sleeper was an experiment to see if I could reduce the stress of such a long journey. We’ve travelled to and from Aberdeen most school holidays since last May using various routes. The sleeper was a great success – I agree with your comments from two years ago about Scotrail missing a trick when it comes to adding luxury – I felt the breakfast could be improved – the continental breakfast was fine – the breakfast bap didn’t really cut it. I’d paid for first class as it was the only way I could get interconnecting berths and was hoping for a full cooked breakfast! Still at least the berths were comfy. Kids slept like logs and I woke to see the sun rise over the sea – brilliant! Glad to find your link for cheap tickets. Thanks for your comment and I’m glad you had a poisitive experience on the sleeper. I am using the service to come back from Inverness to London in a couple of weeks. When I looked for ticket prices they were ridiculously expensive but I have joined the Scotrail ‘Advance’ programme and am going to try a reclining seat rather than a full berth. This brought the price right down and I will update the blog post to let you know how I got on. Many thanks – how wonderfully prompt your reply and nicely unexpected. Thank you. Thank you also for your reassuring words. The sleeper appeals more and more. I’ve seen excellent deals, booking in advance – and I think it would be quite fun. The cottage looks lovely – haven’t located Achilt… in relation to tiny bits of Scotland I know from my one visit. I will bear it in mind, tho’ I can see it is already well booked. Very best wishes, and well done for such an amazing breadth of information on your site. An updated page link for the Bargain Berths offers. I think you can only book 3 months in advance and there are restrictions on the dates of travel. Hi, Great to read your comments! I had wanted to travel to Scotland on a sleeper train ever since I was a nine year old trainspotter on Hitchin Station, I finaly made it at the age of 63 in February 2010. My wife came with me and there was not room to swing a mouse in the compartment. However I have to say that it was a wonderful experiance. When my wife went to Florida in Dec. 10 to see her Daughter I decided to do it again,just for the ride , and enjoyed it just as much. I came back from Inverness first class on a day train, it was not too expensive booking in advance and using my senior Cit. railcard. I appreciate I am a sad case, but I just love railways!!!!! Lovely to hear your story. 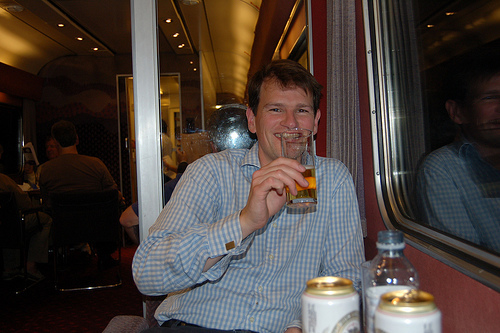 Glad you had a good time on the Caledonian Sleeper. I had a slightly more miserable experience at the tail end of last year when I tried the reclining seat option instead of a berth. Will write up on the site when I get a moment. The wife and I are thinking of using the sleeper train to up to Edinburgh from London in Sept, we were planning to book reclining seats; is this not a good idea? The only time I did the reclining seats option from Inverness to London it was horrendous. The seats on the train I was on we’re packed together and badly configured so you couldn’t stretch out at all without kicking someone opposite. I’m going on next Sunday night. It’s a ride I have longed wanted to do and I am coming back on Virgin to Staffs. within a couple of hours of getting to Fort William. I’ve treated myself to 1st class. Thanks for the report. I think I will take the picnic and book to my berth option and avoid the lounge car. Hey Daphne, how your trip at the Caledonian? I want to know because me and my husband re going to make this trip from Inverness to London on August and I m very confused, because if I try (as a proof, because now it s no available for August) to purchase two tickets for the last avalaible date I can t find a lower price for a berth than £ 249.80, if these are the lowest prices in advance i don t beleive it! And a detail, this fare tells: for a berth or a seat. Where is Achiltibuie & how do you say it?